Communicate to Collaborate - ThoughtForm, Inc. Collaboration is one of humanity’s greatest attributes. When we collaborate we improve our ideas, accomplish enormous tasks, and produce value for ourselves and society. And the push to be more collaborative grows stronger each day. And with good reason—a recent study of 1,100 companies shows that companies that promote collaborative working are five times as likely to be high-performing. But being collaborative isn’t always easy. Researchers Chris Huxham and Siv Vangen have developed a framework for understanding collaboration as two competing forces. On the one hand there is collaborative inertia, our natural state, which results in endless discussions and stalemates. On the other hand, there is collaborative advantage, which results in innovative and new ideas. As the framework shows, you must overcome collaborative inertia in order to realize competitive advantage. If you’re interested in learning more about Huxham and Vangen’s research, you can check out this excellent video by University of Colorado Boulder professor Matt Koschmann. As Koschmann touches on at the end of his video—one of the biggest barriers to collaboration is good communication. To collaborate, you must have a shared vision, as well as a common set of facts and knowledge. In fact, the best communication goes beyond just information sharing—it actually creates shared social constructs and realities. In business today, most communication—especially the persuasive, collaboration building kind—happens in the form of presentations. Presentations are the lingua franca of business today. You can’t really do anything without them. But the vast majority of presentations are tedious, and the audience often leaves without understanding or retaining the key messages. Think about how many presentations you give each year, and how many you attend. What is the average quality? Are you creating connections, building a foundation for collaboration, or are you speaking to a disengaged audience that struggles to understand your meaning? Your teams may be distracted, impatient, or skeptical, but to reach that high-performing status, you must get through. 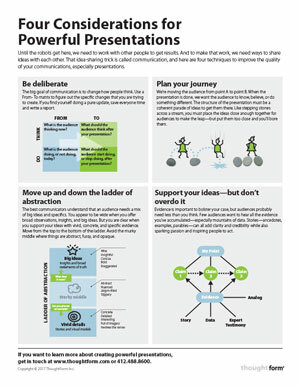 Our illustrated white paper, Four Considerations for Powerful Presentations will help you build skills so you can communicate to collaborate. Improve how you share ideas with others. Four techniques to improve the quality of your communications, especially presentations.